The Club's objectives shall be to stimulate the knowledge and love of gardening in our community; to aid in the protection of native plants, trees and birds; and to encourage civic plantings. The Late Bloomers Garden Club of Forest Hills began in 1999. 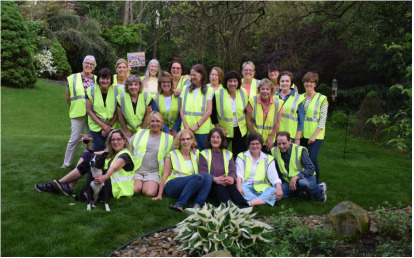 Our members are a fun-loving group that won’t take themselves too seriously except when it comes to tending the six beautiful garden beds along Ardmore Boulevard in Forest Hills. Each garden bed has a different theme for the pleasure of the Forest Hills residents and visitors. One of our projects is to landscape the Morrow Avenue bed to include native ‘Pollinator Friendly’ plants and shrubs. Another garden bed features roses giving it a more formal look. The other beds are left to the design of one our member Master Gardeners. In the Fall, we prepare the garden beds for the ‘Breath of Spring’ by planting daffodils, tulips and hyacinth bulbs. When they bloom the smells are amazing and give the promise of summer coming soon. In the Spring, we start with a general clean up, edging, weeding and pruning. Once the summer comes, the annual flowers are planted with an eye to design using warm or cool plant color schemes. An upcoming project is to design a brochure for the Wildflowers of Forest Hills. During Earth Day Celebrations in Forest Hills, the Late Bloomers Garden Club photographed wildflowers during our Community Celebration. We also participated in the Rotary Club’s Chili Cookoff. We meet in the evening once a month at a member’s home where we discuss upcoming events and trips, have planned speakers come in and talk gardening! Please come to one of our meetings and join in the fun. You will be most welcome. To find out more about the Late Bloomers Garden Club, e-mail us at latebloomersgardenclub@gmail.com. Please visit us and like us on facebook! To find out more about the Late Bloomers Garden Club, e-mail us at latebloomersgardenclub@gmail.com.